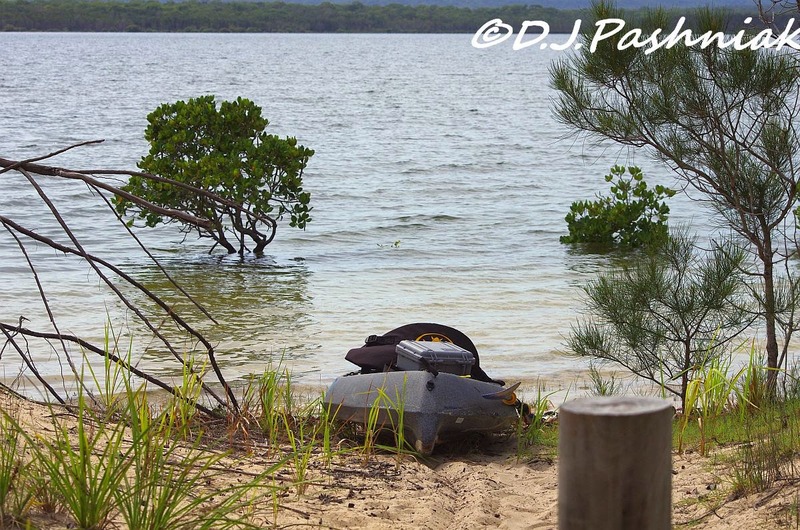 I haven't been out on the kayak as much as I would like recently, and when I have gone out I have only had a short kayak out to the airport roost and then up the creek close by. Last Wednesday was a really high tide and there was almost no wind so I decided it was time to go out to Mullens again - which is twice the distance of where I have been kayaking recently. 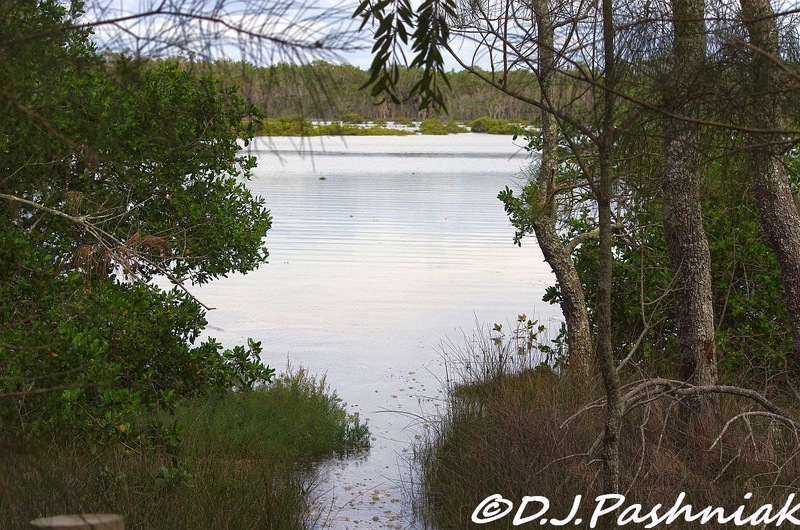 Of course the Mullens roost is also available simply by walking around the foreshore but when the tide is right in you can pretty much guarantee that the birds will be on the far side of the roost. At that distance you can see them and ID them if your binoculars are good but it is impossible for good photos. In the kayak you can let the wind and the tide drift you in close to the birds without disturbing them if you are careful. It was a very pretty morning. 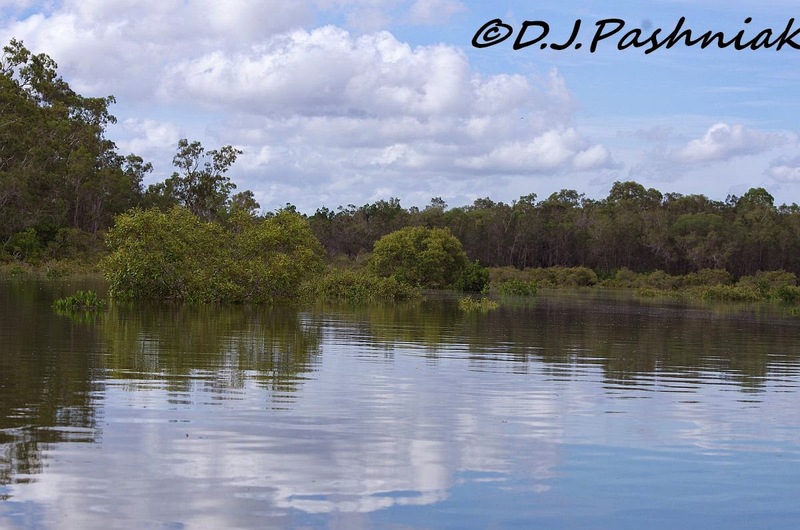 Here where I live in SE Queensland, Australia the light is usually very bright - bright sunlight, bright skies, and lots of bright light off the water. So when the conditions are not like that I struggle to get photos with the colors I expect. The birds were still there - but with these lighting conditions even they were hard to see - and not spectacular the way I want them. 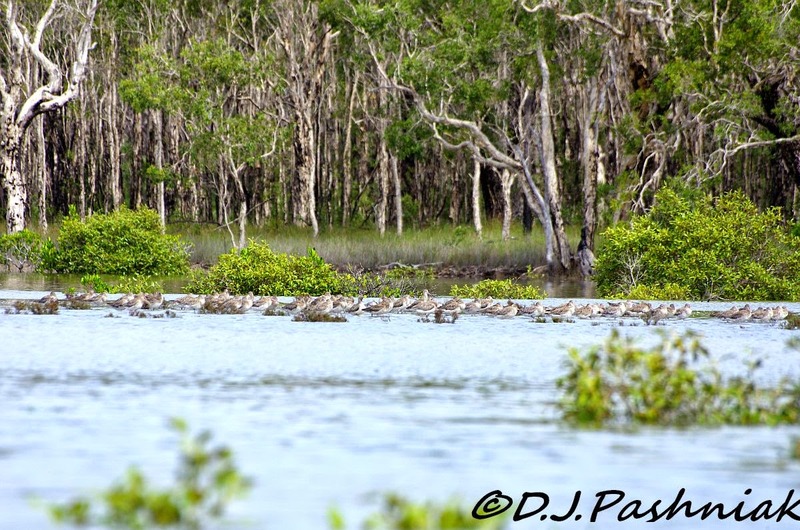 There were lots of Bar-tailed Godwits but grey and brown birds against a brown background are not really interesting. 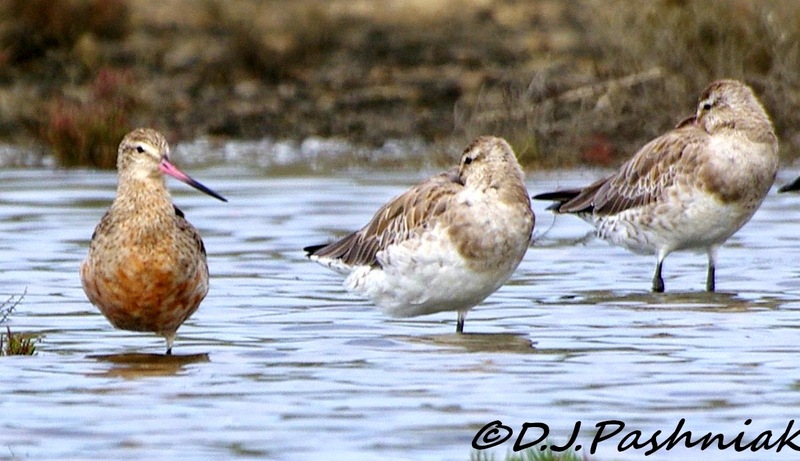 Finally I drifted in close enough to see that some of the Godwits were getting their bright breeding colors. There are always some birds that get color before the others. 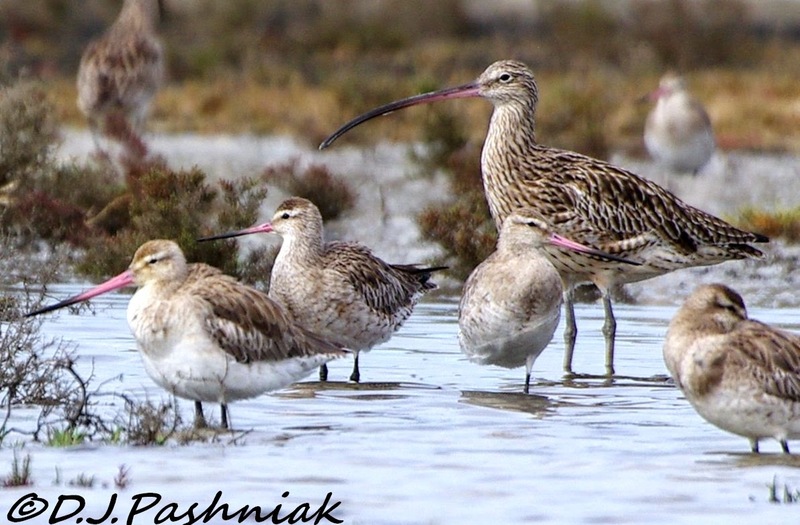 A little further around the roost there were Eastern Curlews standing close to Godwits. The size difference is quite striking when they are standing close like this. Although Curlews don't get bright colors for breeding, the browns and blacks darken and their patterning is more distinctive. 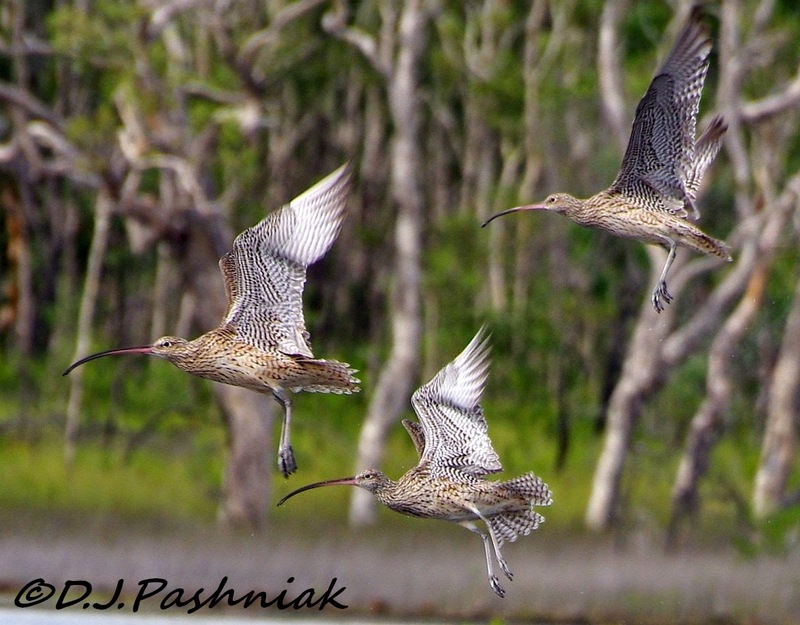 Curlews must be the flightiest of all the shorebirds that visit down here. It is nearly impossible to get close to them without some - at least - flying up. These ones gave a good view of the beautiful under-wing feather patterns. Smaller birds were massed right at the top of the bay. 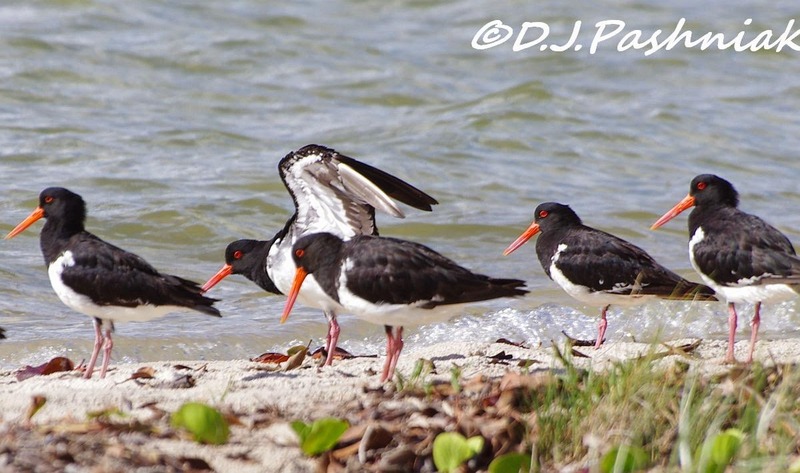 When I got closer I could see mainly Red-capped Plovers and Red-necked Stints. 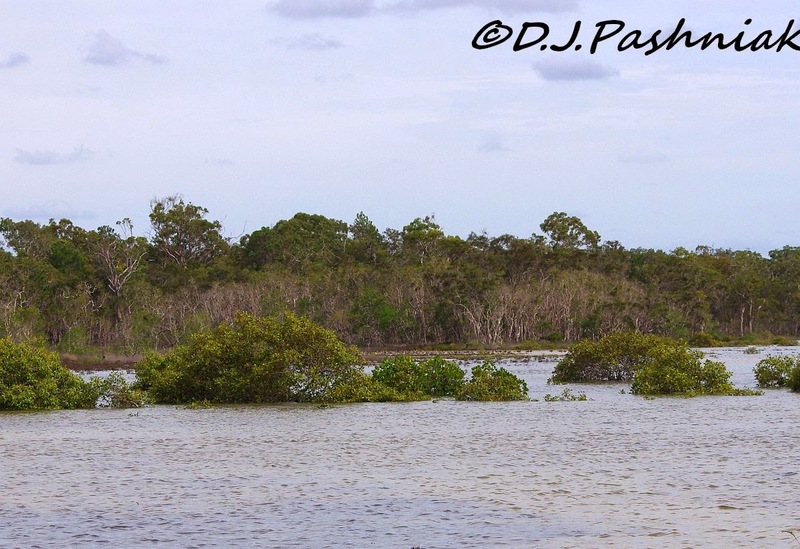 There is only a narrow sand spit which separates this shallow roost site from the main bay and on a very high tide like this there is a very short distance from one side to the other. The tide comes in under the trees and right up to the bollards. The top of one bollard is just visible on the lower left of this photo. Just a few meters away is the main bay and it was just beginning to get a chop on the water. Most of the time I revel in nice warm weather but when 'warm' becomes 'hot' I am not so enthusiastic. We have had more than a week of this extreme heat but yesterday it broke in typically spectacular fashion. 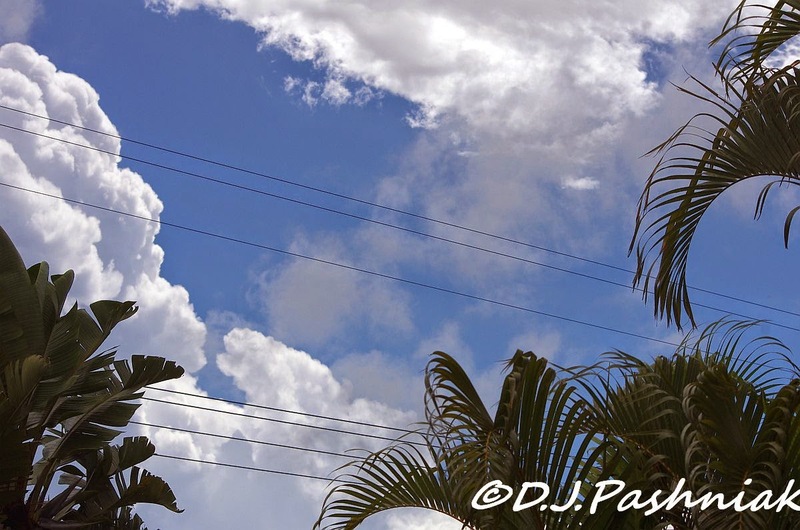 This was the view out the front of my house as the thunderheads built up. 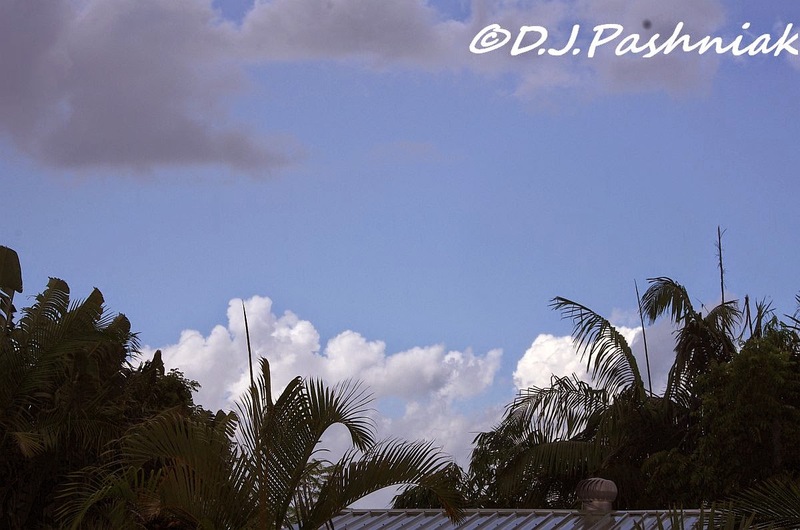 I know there was hail in the storms because the temperature rapidly became quite cool and pleasant. We were only on the edges of the storms this time and we only got light rain. I wish you could have heard and seen the birds as the light rain came through. I have some big trees in my backyard and flocks of birds danced in them, turned somersaults and flung themselves into the air again, and fights broke out for the most desirable roosts - all the time screaming at the top of their 'birdy' voices. 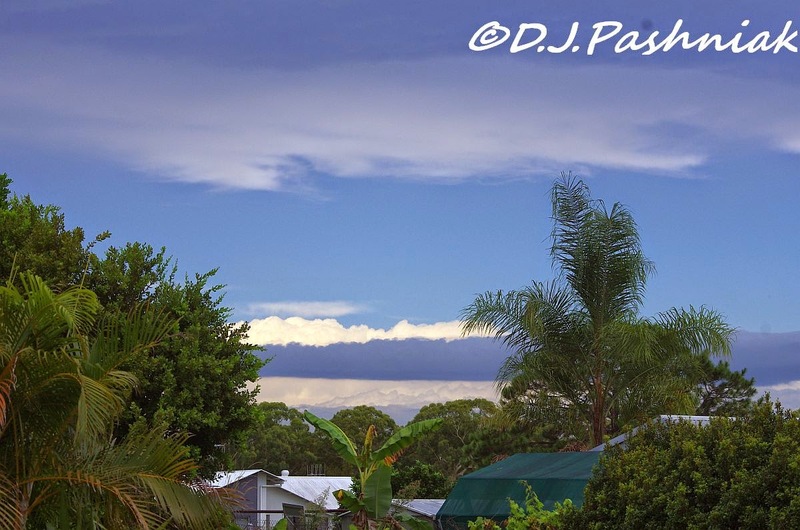 Meanwhile the passing storm clouds created beautiful backdrops for their activities. The only birds I have photographed are ones in my backyard - and most of them in the early morning before it got too hot. 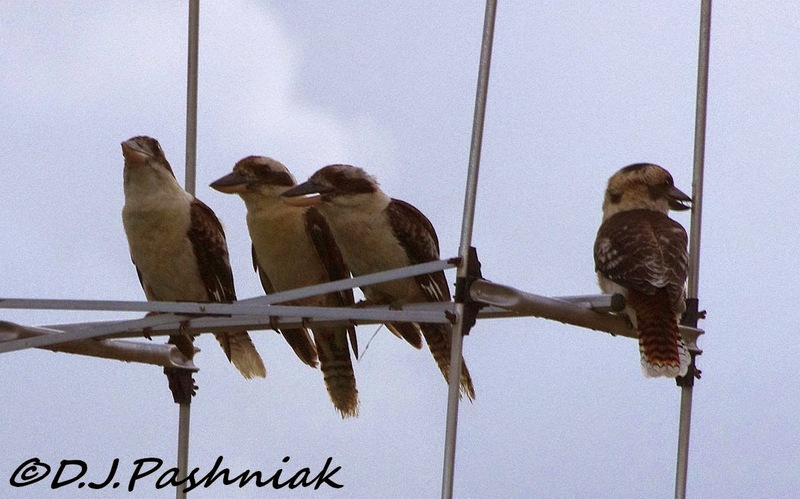 These kookaburras were out before it was even light and announcing their presence with a group laugh. They are sitting on the neighbor's TV aerial. 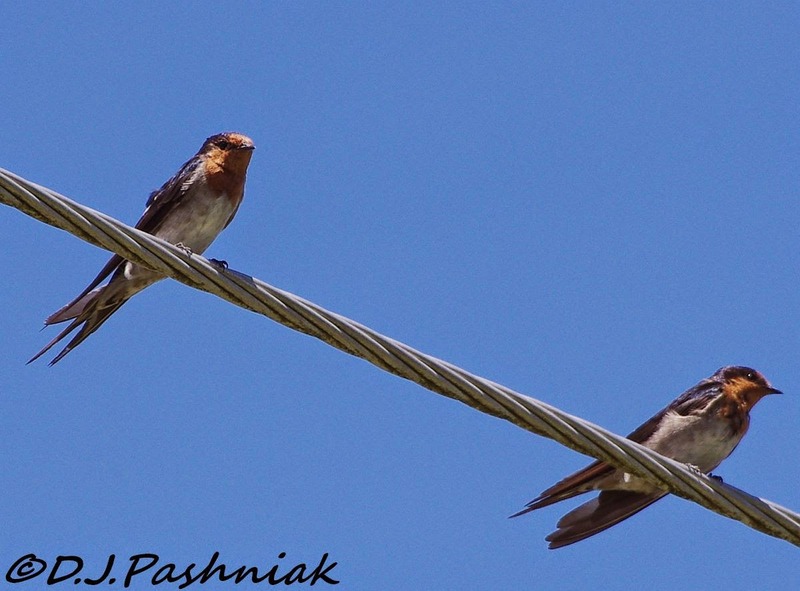 These Welcome Swallows are usually seen swooping high in the air as they chase bugs in the early morning or late afternoon. 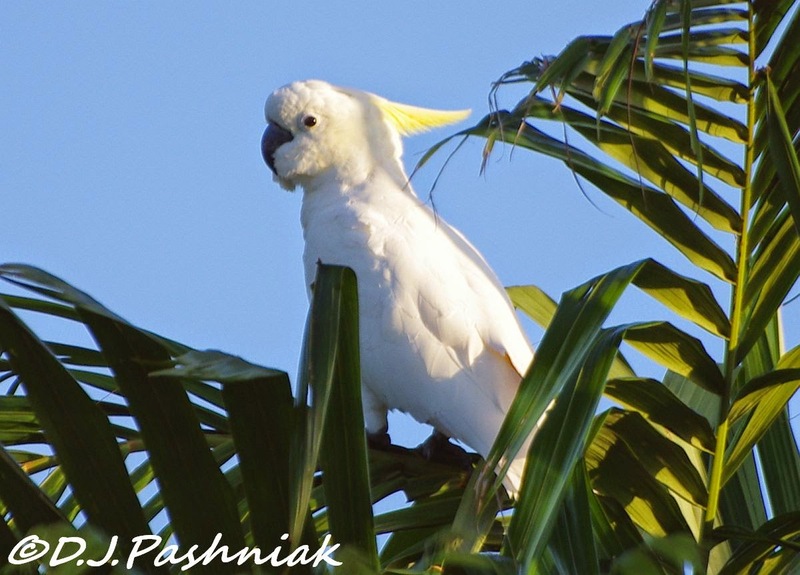 "Cockies" (Sulphur Crested Cockatoos) fly over every morning and night but this one came down into a palm tree and added to the patterns of light and shade in the early morning light. 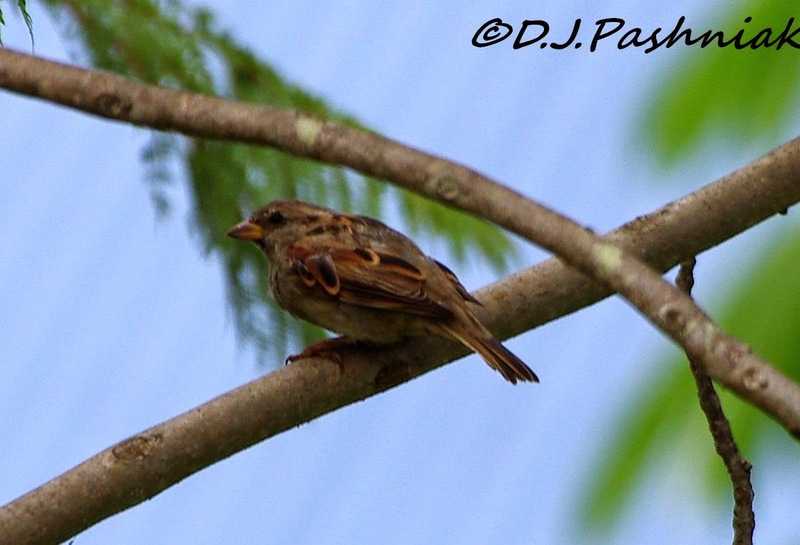 There is quite a large group of sparrows (an introduced species in this country) that have taken up semi-permanent residence in the trees in the backyard. 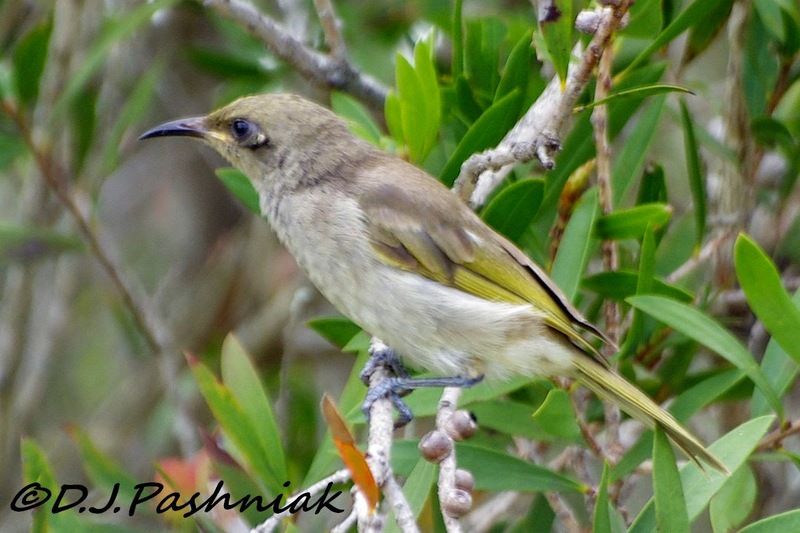 However, I already have a group of Brown Honeyeaters that consider that their own place. It does not seem to me that they are happy with each other because they have frequently been sitting in branches close together and giving loud cries of annoyance! It will be interesting to see if they learn to co-exist or if one lot chases they others out. Just south of Norman Point the bay curves around south again. In this curve of the bay I often see shorebirds and seabirds roosting. 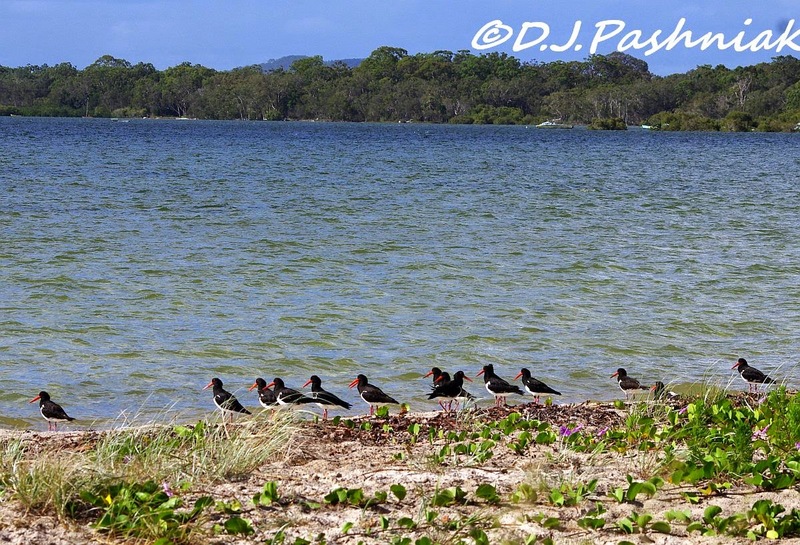 The other day there was quite a large group of Pied Oystercatchers roosting on the small strip of sand that was all that was left from the higher than average tide. 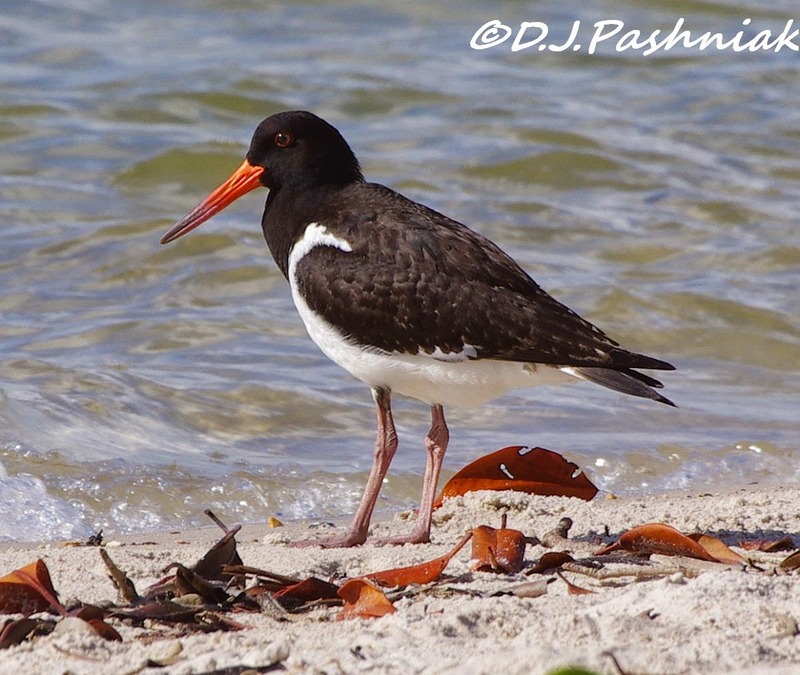 I have been told that Pied Oystercatchers breed south of here in greater numbers than we see around here. They then fly north and disperse. I wondered if I could definitely ID any juvenile birds but this was the only one I was sure about. 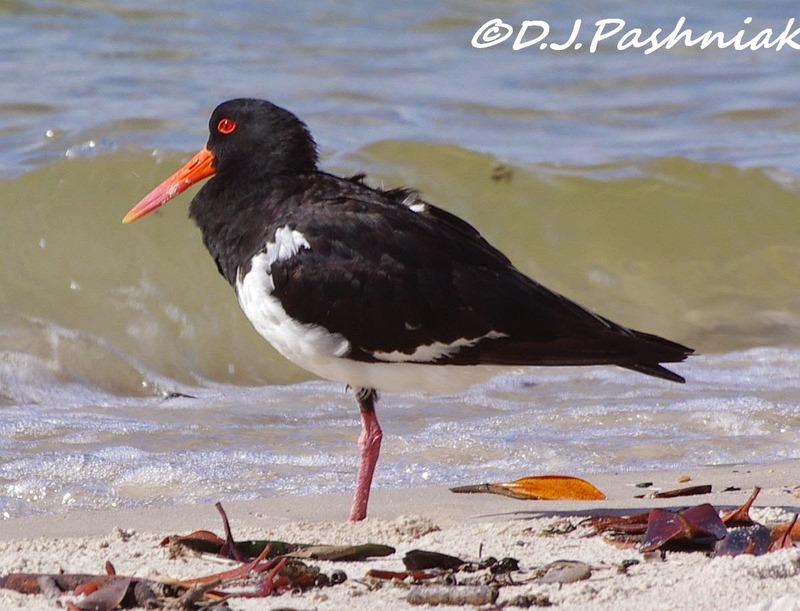 The legs are not quite so pink, the eye is more brown than red, and there is a darker patch on the lower part of the beak. 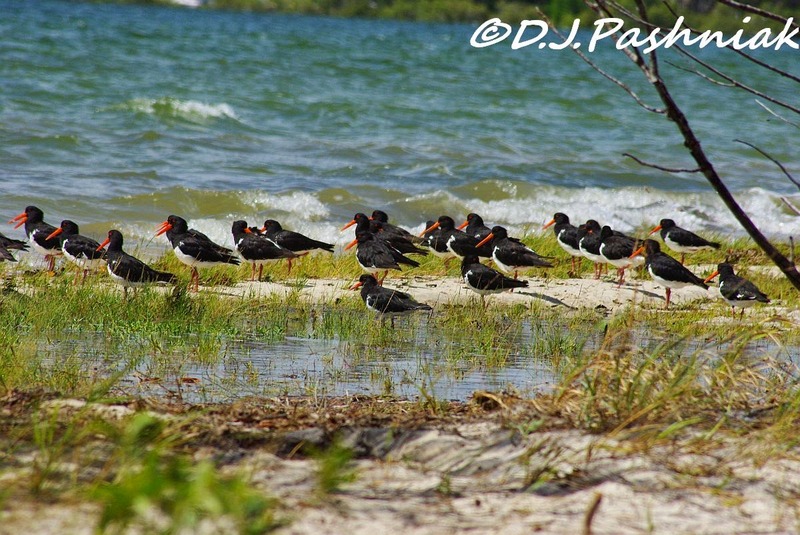 I have seen similar flocks of Pied Oystercatchers roosting here in other years and when I searched my photo archives I found this photo - taken in 2009 and also in January.